The "clean energy economy" always seems to be a few steps away but never quite here. Most energy for transportation, heating and cooling and manufacturing is still delivered using fossil fuel inputs. But with a few scientific breakthroughs, hydrogen, the most abundant element in the universe, could be the energy carrier of a future clean energy society. Taking one step closer toward the elusive goal, a team of scientists from Penn State and Florida State University have developed a lower cost and industrially scalable catalyst to produce pure hydrogen through a low-energy water-splitting process. "Energy is the most important issue of our time, and for energy, fuels cells are crucially important. And then for fuel cells, hydrogen is most important," says Yu Lei, a doctoral candidate at Penn State and first author of a new paper in ACS Nano describing the water-splitting catalyst she and her colleagues theoretically predicted and synthesized in the lab. "People have been searching for a good catalyst that can efficiently split water into hydrogen and oxygen. During this process, there will be no side products that are not environmentally friendly." "Molybdenum disulfide (MoS2) has been predicted as a possible replacement for platinum, because the Gibbs free energy for hydrogen absorption is close to zero," says Mauricio Terrones, professor of physics, materials science and engineering and chemistry at Penn State. The lower the Gibbs free energy, the less external energy has to be applied to produce a chemical reaction. "What happens in these alloys is an exquisite overlap of orbitals which makes the reaction more efficient. This is not observed in the pure components. 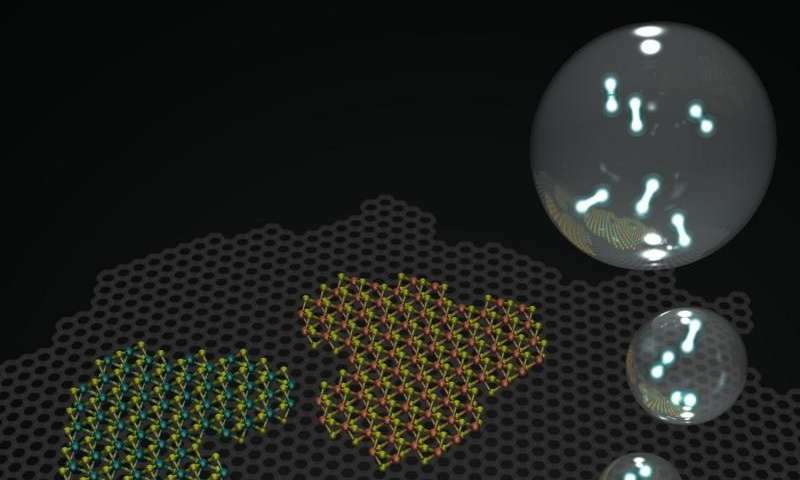 It is an example where the hybrid is better than the pure components," says Jose L. Mendoza-Cortes, professor of chemical engineering, materials science and engineering and scientific computing at Florida State.